The Hideout Lodge & Guest Ranch is a riding, natural horsemanship and working cattle guest ranch located in Shell, Wyoming, east of Cody and Yellowstone National Park. With around only 25 guests at a time, travelers are granted to an intimate ranch experience. Located in Shell, Wyoming, guests ride on 650,000 acres on the ranch, as well as in The Big Horn National Forest, Cloud Peak Wilderness and beyond. What Makes This a TopRidingVacation? This Wyoming ranch offers guests a unique ranch vacation largely because of the focus on diversity and quality. The Hideout’s staff and owners care deeply about their guests, their experience, the horses and their horsemanship program. With around 650,000 acres of some of the most diverse terrain and scenery, elevations range from 4,200 ft to 10.000 feet. A fleet of eight quality truck and trailer combinations enable travelers to explore the vast area in all directions. This Wyoming dude ranch’s guests represent the diversity they embrace as they travel from all corners of the world, and the US, to indulge in a weeklong equestrian experience. Many travelers return because they learn The Hideout team is a group of passionate professionals who care. Diversity as one of this guest ranch’s most important assets. The Hideout’s Authentic Horsemanship program stands for open-minded horsemanship. At The Hideout’s sister ranch, a horsemanship clinic program with a herd of 130+ horses of all levels includes mostly Quarter Horses, but also a growing number of Mustangs. Most visitors come for a small scale equestrian quality experience with well cared for, responsive horses, a great horsemanship program and a very hospitable, caring and professional team taking care of you. This Wyoming ranch is popular with solo travelers and mixed parties of very experienced riders. Intermediate or beginning riders also travel together to this ranch that can accommodate all levels. The ranch was started in 1995 as part of one of the bigger cattle ranch operations in the area. The current owners have operated it since 2007 and have grown it to a diverse, international and upscale equestrian direction. Both owners are from Europe, very well-traveled and culturally astute. They have incorporated previous business and travel experience trying to create what they believe is the best equestrian hospitality experience with an open mind in the American West. The Hideout offers smaller portions of gourmet Western food with a European touch, prepared from scratch with healthy ingredients. Diversity is paramount in the food also. Ranch chefs cater to dietary restrictions as long as they are reasonable, considering the ranch operates in a remote location. Fish, meat, chicken, pasta, pork, bison and vegetarian dishes are on the menu. Guests stay in well-appointed log cabins with internet, phone service, air-conditioning and heating, a Nespresso machine, refrigerator, private bathroom and more. Many guests describe the accommodations at The Hideout as “resort level,” giving guests an upscale boutique experience. The Hideout Ranch pays attention to detail and takes pride in a very clean operation. Rooms are cleaned daily and the sheets are changed on Wednesday. The Hideout Ranch also offers a brand-new luxurious lap pool. Horseback riding, horsemanship clinics, fly fishing, trapshooting, hiking, biking, 4×4 tours, archery and trips to see nearby farms and the Cody Nite Rodeo. Fly-fishing guides take you to fish for Cutthroat, Yellowstone Cutthroat, and Rainbow as well as Brook and Lake Trout on 10 miles of streams, creeks and lakes with a variety of eco-systems. Special vacations include Girls Getaways, Corporate and Team Building Retreats, Advanced Riding Retreats, Family and Friends Packages and more. Time in the saddle may vary from 2 hours to 8 hours daily depending on the experience each individual guest is seeking. With choices for horsemanship clinics including liberty, groundwork and on-line, riders have many choices for equestrian and riding activities. The day is not rigidly set, rather guests may choose what they like for a flexible riding vacation. 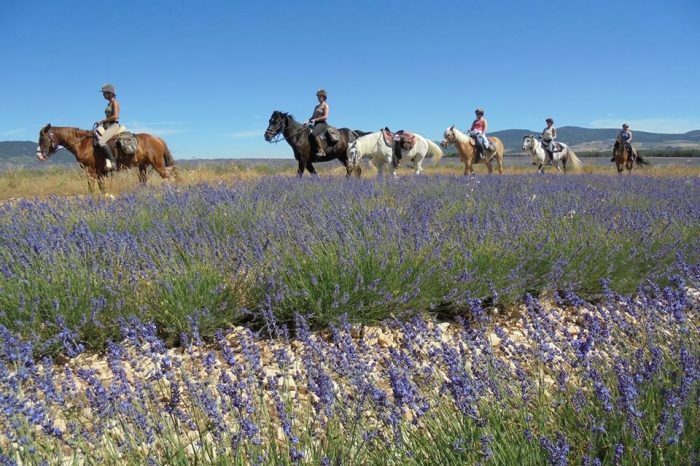 The Hideout Ranch offers riding holidays with non-riding activities for those who need a break from the saddle. That means that hard-core riders with partners or friends of lower levels or beginners can both enjoy this riding vacation. Riding lessons and horsemanship clinics are included in packages and guests are encouraged to participate in them. $416 / $539 a night, all included – 4 nights minimum stay required. This ranch works with travel agents!